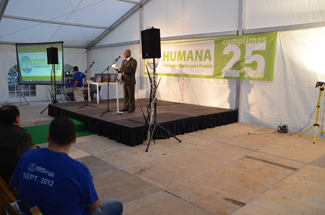 Around 250 people including employees, friends and members of the Foundation participated yesterday in the Open Day organized at the headquarters of Humana Leganes (Madrid) on the occasion of Humana Day 2012 and the celebration of the XXV Anniversary of the entity. 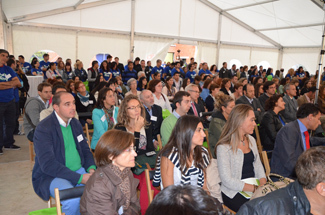 Furthermore Torrejón de Ardoz received the 'Award for Most Innovative City in the field of Textile recycling', while the City of Rivas Vaciamadrid was awarded the 'Award municipality with the highest increase in number of containers in 2011'. It was also awarded a special prize to the City of Leganes and 'Most supportive media Award' for the Espejo Publico tv program of Antena 3 channel. 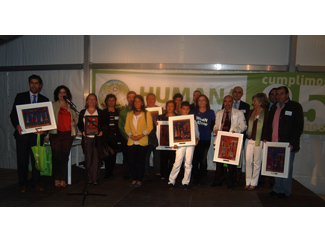 With the event yesterday, puts an end to the events organized during the month of September following the Humana Day and XXV Anniversary of the entity.